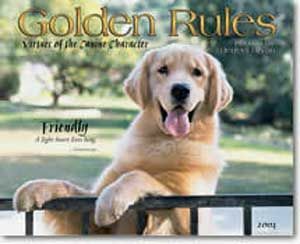 Visit our Pro Shop for the latest Golden Retriever Calendars. Just as these natural abilities are inherited, so can the inabilities. It is important to note that inborn talent relating to purpose can only be observed and/or proved at Hunting Tests/ Field Trials or in NATURAL HUNTING CONDITIONS ?on both land and water. It is imperative that we, as keepers of the breed, continue to carefully observe retriever events to see where these talents are consistently evident, and where they are not. The more dogs we study, the more valuable information we can gather. And the more we train and test and work with our dogs, the more we can learn to understand and appreciate what we are seeing! In simplest terms, a valuable retriever is one who locates and delivers game to hand as quickly as possible, obediently, and in a stylish manner. Any deviation from this ideal is considered faulty. The severity, frequency and accumulation of these faults allow us to distinguish between poor, acceptable, and superior performances. But what does this mean? And why is it significant? Let’s examine some of these fundamental traits as described in the AKC retriever rules and guidelines booklets to help answer these questions. One of the most important of all of these natural qualities is the ability to mark. A good marker makes a mental picture of where the bird fell, and holds that picture clearly in mind? going directly to it, disturbing as little cover as possible. Good markers can make many intelligent extrapolations about a fall, and generalize information they have gathered in previous marking experiences to accurately navigate to new falls. An exceptional marker is a wonder to behold? and demonstrates a trait that has been proven to “run in the family”. 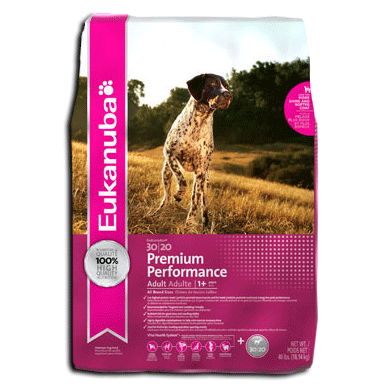 Accurate marking ability and memory can be improved and developed, but cannot be instilled in a dog. A retriever need not pinpoint every mark (though no one would be unhappy if that were the case! ), but a good marking dog will quickly recognize any error in line or depth perception he may make, and work quickly and intelligently at rectifying himself to the bird. An exceptional marker will make far fewer misjudgments than a mediocre one, and will therefore be a much more efficient retriever. Efficiency is a key element in game conservation, as often birds can be crippled and escape recovery without a sure, swift, capable retriever. And when a dog remembers where subsequent/multiple birds have fallen, he is even more effective, as he doesn’t cover more ground than needed, he doesn’t disturb cover unnecessarily, and he needs no further direction from his handler. These vital working talents are all based in genetic traits we need to identify and select for to keep viable in our breed. Serious marking faults would include: lack of ability to mark where the bird fell and inability to remember the fall. Other faults relative to marking would include: lack of interest in looking out, lack of commitment in going out, lack of perseverance in getting to the bird, lack of courage in negotiating hazards, lack of focus on what he was sent for, and lack of desire for game. These are all traits that can be based on inherited tendencies, and severely limit the value of our dogs as effective hunting companions. It may be equally important to consider that any of these shortcomings would also limit our dogs in other endeavors at which the Golden Retriever has come to be so proficient. Regardless of our views of hunting, it behooves us to commit ourselves to these essential qualities, which define the breed we nurture. 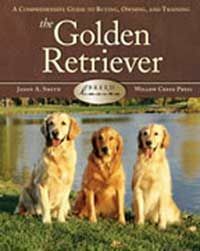 Intelligence is a highly desirable trait in dogs bred for any purpose, and it is one that is difficult to specifically test for in a retriever. Intelligence is demonstrated as part of a whole package of skills employed to get a job done effectively. An intelligent dog will capitalize on all of his natural abilities to solve problems, and efficiently rectify any confusion in judgment he may make in order to be successful. We know intelligence when we see it? if we are skilled at observing dogs at work and understand the factors at play in the situation. Seeing a dog work at solving a problem can be a revelation of how his mind operates, and can give us great insight into his IQ. Here again, we may develop the intelligence a dog is born with through good training, but we can’t add any more gray matter than Mother Nature put there to begin with. So we had better choose his parents wisely! Attention is another quality that is closely associated with the category of style, which we will talk more about later. But we cannot overestimate the importance of style in a working dog, and we cannot have a stylish worker without good attention. Attention is evident in the way the dog approaches any situation. He is alert, eager (sound familiar?) and has a general attitude of confidence in anticipation of what he is about to do. He is keen to his surroundings (looking out for the guns, birds, etc. ), while remaining attentive and responsive to his handler. Though responsiveness can be trained in most attentive dogs, natural attentiveness comes in the genes. A dog that displays a lack of interest in his world around him, or in his profession, is a poor candidate for many tasks, and makes a very frustrating training partner in any endeavor.